U.S. President-Elect Barak Obama will soon have the pleasure of seeing two Drum Corps International units marching down Washington DC's Pennsylvania and Constitution avenues, as the Cadets of Allentown, Pa. and the Colts of Dubuque, Iowa, recently received invitations to participate in the Presidential Inaugural Parade on Jan. 20, 2009. "To be selected to participate in an event of this caliber is truly an honor," said Cadets director George Hopkins. "This corps has been a part of many prestigious and memorable events, and the Inaugural Parade is another once-in-a-lifetime experience for the organization and its members. Jan. 20th will be a milestone for our nation and the Cadets will play a part in this historic day!" Nearly 1,400 organizations applied to take part in the parade, but only a select few (between 70 and 90) were chosen to participate. Applications had to be accompanied by a list of organization information and accomplishments, still photos, and audio/video performance clips. The Colts even had the opportunity to include letters of support from Iowa Senator Charles Grassley, Governor Chet Culver, and a handful of other Iowa Representatives and politicians with their application. "Our inclusion in the Inaugural Parade is an incredible honor. We will be proud to represent the state of Iowa in this historic event," said Colts director Greg Orwoll. Both the Colts and Cadets will now undergo a hectic planning period as they work quickly to solidify all of the logistics necessary to bring their corps members to the DC area the third week of January. 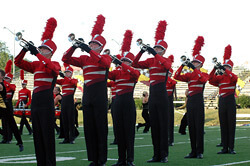 The Cadets have already rescheduled a January rehearsal camp to accommodate for the parade, and both groups will start fundraising efforts to offset the expenses. 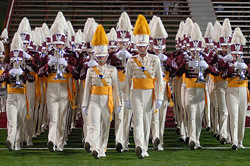 Historically, a host of Drum Corps International units have played for U.S. Presidents as part of the Inaugural Parade, most recently the Troopers of Casper, Wyo. in 2001 and the Spartans of Nashua, N.H. in 2001 and 2005.